Hustle & bustle, originally uploaded by Aaron78. The bike lanes are busy first thing in the morning. When you approach a junction, there's a lot of jostling to get into the best position for when the lights turn green. Not for this girl though, as cool as a cucumber. Your daily dose of Copenhagen Cycle Chic. Hi, I've just started to blog about commuter cycling in Australia and came across your site. I think your photos portray something all cyclists down here would envy - no not the girls, but a culture where commuter cycling is so common & taken for granted by the general community. I'd appreciate it if you would let me use one of your pics as a link to your site? Thanks! sure, radzi, just let us know which flickr photo you like in advance. 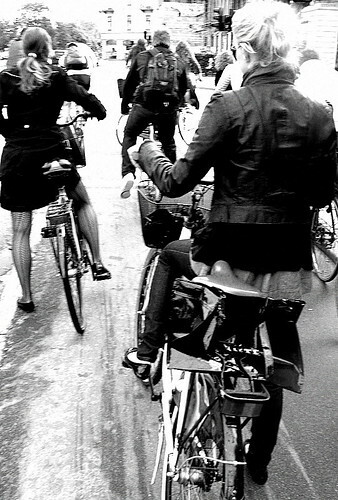 we also have a Copenhagen Bike Culture Blog at http://cycleliciousness.blogspot.com which may be of interest.